July 22, 2013 (Seattle, WA) – Interested in community gardening? The 34th Annual American Community Gardening Association (ACGA) Conference is coming to Seattle, August 8 – 11, and is opening its workshops and tours to the public. On the tours, participants can visit innovative sites, learn about community orchards, even study garden design and art while meeting people from around the world who are involved in community gardening. Most tours occur on Saturday, August 10 from 12:30 – 5:30 p.m. All tours cost $40 and include lunch and transportation. To view the tour descriptions and to register, visit the ACGA website. • Friday – Keynote speaker, lunch, and workshops from 8 a.m. – 5 p.m. for $75 • Friday night – Gala Dinner and Silent Auction for $85 • Saturday – Workshops from 8 a.m. to 12 noon for $40 • Saturday and Sunday – Workshops, tours, and closing panel from 8 a.m. – 12 noon for $80. To learn more about each day’s activities, view the conference schedule and register here for the a la carte sessions. The conference will be held at University of Washington’s Gould Hall (3949 15th Ave NE). 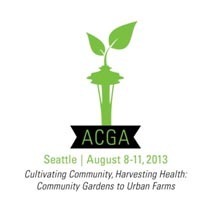 The Seattle Department of Neighborhoods P-Patch Community Gardening Program is a host of the ACGA Conference. For more information on the workshops and tours, contact Sandy Pernitz at sandy.pernitz@seattle.gov. Tagged with: 2013, events, meetings.